When asked how the i-digits™ partial hand prosthesis has changed her daily life she remarks that the greatest change has been to her independence. She has more independence at work as she has full use of her hand and the i-digits™ partial hand prosthesis which allows her to type, carry files and complete other office duties with ease. At home she is able to carry groceries from the car and her new hand allows her to do the things she enjoys, like cooking. Bridgette admits that after the accident she feared she would never be able to cook at the same level again. With her partial hand prosthesis she can be active in the kitchen again. She can easily cut vegetables, hold pots to season food and she says she loves the fact that she can hold onto pots with her prosthesis without fear of being burnt. Bridgette says the best thing about 2018 was seeing how far and how quickly her abilities progressed in order to control and use the hand prosthesis. She also notes that her favourite thing about the i-digits™ partial hand prosthesis is how responsive it is and how it moves just like a normal hand. The only time she takes it off is when she goes to sleep, it fits like a glove so putting it on every day is no different than the glasses on her nightstand which she also puts on again every morning. Over the course of Bridgette’s journey she has realised that when sharing the stories of her experience, both pre and post Scotland, she is sharing what God had blessed her with. This blessing allows her to act as an educator and beacon of hope for others living with disabilities and amputations to show them how capable they truly are. 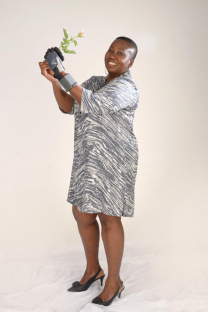 After appearing on television on SABC 2’s YO-TV and featuring in the Die Beeld newspaper Bridgette has become somewhat of an i-digits™ partial hand prosthesis celebrity. People recognise her and often ask for a picture with her as well as her honest advice. The people she meets often ask her to sign an autograph with the i-digits™ partial hand prosthesis and to shake their hands with it. They are always astounded when they see the extent to which she can use it as well as when they hear the sounds the i-digits™ partial hand prosthesis as she changes gestures. A year after Bridgette’s journey to Scotland with Jaco she is a changed woman. Whereas before she would avoid talking about her amputation she now relishes the opportunity to show off Deist’s handy work. If you would like to read more Success Stories from Jaco Deist’s patients click here. For professional prosthetic and orthotic services contact Jaco Deist and his team.